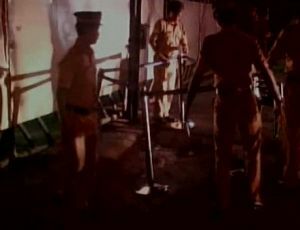 A day after CCTV visuals emerged of CISF personnel on the rampage at Karipur airport in Kozhikode, fresh footage of the episode has appeared in which a group of alleged Airports Authority of India officials in plainclothes are seen attacking a CISF jawan. As per the visuals aired by television channels on Friday morning, a CISF jawan was surrounded and beaten up by a group of AAI officials following an altercation between him and an airport official over frisking. After resisting the attackers for a few seconds, the jawan is seen fleeing the area with the irate AAI staff giving chase. Within seconds, the AAI staff are seen running away from the area and rushing inside the airport building, having apparently witnessed something to scare them away – perhaps the gunshot that claimed the life of a CRPF jawan. However, what drive the AAI staffers back is not seen in the clipping. CCTV visuals aired yesterday had showed a group of CISF personnel, apparently agitated over the death of their colleague, jawan Jaipal Yadav, destroying airport property. In the unprecedented violence at the Karipur airport, a CISF jawan was killed and three others were injured when a service revolver went off during a clash between CISF personnel and fire officers of AAI. Karipur airport, which was closed for over six hours after the violence broke out, became operational on Thursday morning after normalcy was restored. Meanwhile, ADGP (North Zone) N Shankar Reddy has submitted a preliminary report on the violence to the Director General of Police. "A preliminary report on what exactly happened was submitted to the DGP," Reddy told PTI. "Everything is on CCTV," Reddy said when asked who was responsible for the violence and the shooting. "The incident involves two central government organisations. We will go by the evidence and will follow up with legal procedures," said Reddy.